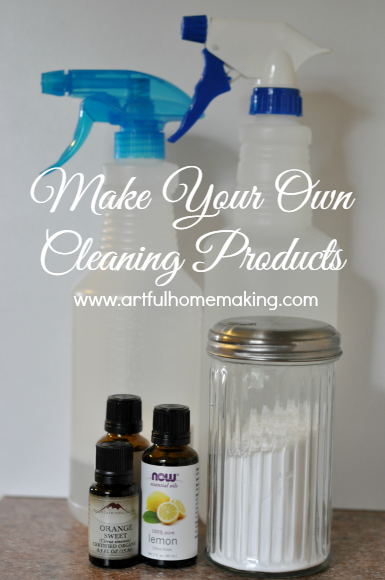 Make your own cleaning products with these simple recipes! 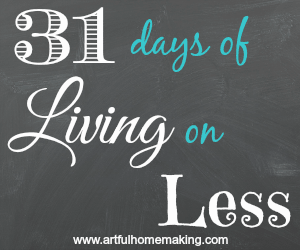 This is the fourteenth post in my 31 Days of Living on Less Series. If you’d like to read all the posts in order, go to Day 1. Sometimes the cheapest way is to make it yourself. And I think that’s often true of cleaning products. Not to mention the fact that if you make it yourself, you can use safe, non-toxic ingredients. As a newlywed, my mother-in-law introduced me to the idea of using vinegar to mop the floors. It was cheap and effective, so that’s what I’ve used for years now. I’ve also used vinegar and baking soda to clean toilets, sinks, and many other things. I love that they’re so cheap and so safe! Today I thought I’d share a few simple and effective homemade cleaning recipes with you. Combine all ingredients in a spray bottle and shake well to mix. Label bottle and shake well before each use (the cornstarch might settle). Combine in a spray bottle and shake well. Mix all together in a spray bottle. Pour about 1/4 cup of baking soda into toilet bowl. Add about 1 cup of white vinegar. Let sit for a few minutes, then scrub with toilet brush and rinse. This is super simple. Just clean the wood surface with a damp cloth and then dry thoroughly. Rub some coconut oil into the wood (just takes a couple of tablespoons) with a soft cloth. This nourishes and protects the wood. I mostly use this on the top of my wood kitchen island that gets heavy use. Combine the mixture in a small jar or bottle and shake to combine. When you’re ready to use this, it only takes a small amount on a clean rag. My mom shared this recipe with me, and it works really well! These are just a few of my favorite recipes for homemade natural cleaning supplies. There are so many more natural cleaning recipes that would make a great substitute for chemical-laden cleaning supplies while saving money at the same time. You can find more cleaning tips and recipes on my cleaning/organizing Pinterest board. Friday is cleaning day at our house, so I’m off to clean! In regards to your all-purpose cleaner with hot water (and hopefully it's not a duh question), but what if you don't use it all up at one time? Can you just reheat it in a glass container and reuse? Not a silly question at all! The hot water just helps the borax to dissolve when you're making it. If you have some left after using it (I always do), just store it in the spray bottle it was mixed in, and shake it up a bit before using the next time (no need to reheat). Hope that helps! Regarding your all-purpose cleaner that requires hot water…what if you don't use it all up at that time? Can you just reheat it all at another time in a pyrex glass or something?